For your friends and family nothing but the best will do. 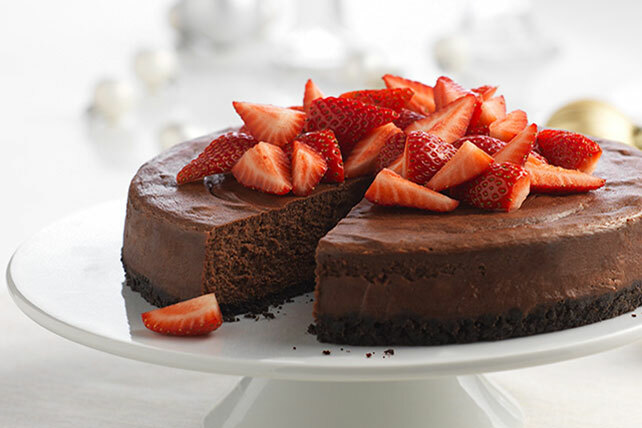 So try our chocolate cheesecake recipe today. Watch now to learn more! Beat cream cheese, sugar and vanilla in large bowl with mixer until blended. Add chocolate; mix well. Add eggs, 1 at a time, mixing on low speed after each just until blended. Pour over crust. Refrigerate cheesecake 4 hours. Top with strawberries just before serving. Looking for a special treat? One serving of this creamy cheesecake is full of chocolatey flavor. Place completely unwrapped packages of cream cheese in microwaveable bowl. Microwave on HIGH 45 sec. or until slightly softened. Prepare recipe as directed, substituting a greased foil-lined 13x9-inch pan for the springform pan, and reducing the baking time to 40 to 45 min. or until center of cheesecake is almost set. Use foil handles to remove chilled cheesecake from pan before cutting to serve.